control the Camera of your Android or iOS device using another device. The apps name is Remote Shot and available for both Android and iPhone smartphones, yes it’s free you can download it from Google Play store or iTunes Store. With the help of the app you can click the pictures on your camera with pother device. With this you can use the second device as a remote control of first device. This app is really helpful to take self-shot of family, in such type of situation you can use your second device as the remote to click the picture from thew first one. The app allows you to connect your Android or iPhone using one as camera and one as remote to see live stream preview. All you have to do is install the app on your devices and have to select which device you want to use as camera remote control. As we mention above the app is totally free and work smoothly on all android and iOS devices. To connect both the device with the app, you have to enable the Bluetooth connection on your devices. If Bluetooth is not turned on, the device does not connect. Once both the device are connected, you are ready to go to click the pictures from your device remotely. You can see live preview in your remote to adjust your location. 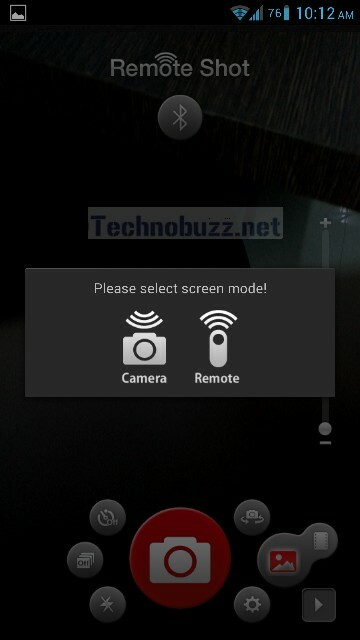 The app also give you other features also, like zoom, Flash Auto/on/off, Burst Shots, Image mode or Video Mode and all. The app is easy to use and you must have to try this on your devices to remotely control your phone camera. We tested this app on our Galaxy S3, One X and iPhone 4. The app works smoothly on all our devices.